This decorated pan (trulla) would originally have had a handle and base, which are both missing. Like the helmet on the previous page, this is evidence of the Roman army in Britain. 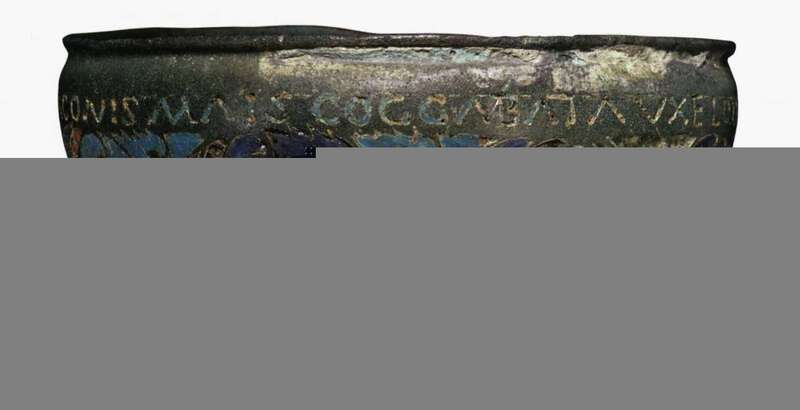 Below the rim is an inscription inlaid with enamel that encircles the pan: MAIS (Bowness-on-Solway) COGGOBATA (Drumburgh) VXELODVNVM (Stanwix) CAMMOGLANNA (Castlesteads) RIGORE VALI AELI DRACONIS. The first four names are forts in the western sector of Hadrian’s Wall. The second part of the inscription is more difficult to interpret. RIGORE VALI seems to be a direct reference to Hadrian’s Wall, known in Roman times as the “Vallum”. Aelius was Hadrian’s family name, so AELI may specify “the wall of Hadrian”. Alternatively, it could belong with the word DRACO, forming the personal name Aelius Draco (or Dracon), possibly a soldier who had the pan made as a souvenir of his military service on the Wall. From Staffordshire moorlands, England, II century AD, D. 9,4 cm. Joint acquisition between the British Museum, the Potteries Museum and Art Gallery (stoke-jn-Trent) and the Tullie House Museum and Gallery (Carlisle), purchased with substantial and generous support of the Heritage Lottery Fund.